EdaMovie™ – Edamame At The Movies – will be coming to select theaters in May 2015. “What people choose to eat is rapidly changing and edamame is part of that trend,” says Dr. Ron Law, retired heart doctor and creator of EdaMovie™. As movie theaters are re-inventing themselves nationwide to reach more customers, EdaMovie™ will fit well into that strategy. EdaMovie™ will be marketed as a fun food, high in protein and gluten free. These beans are also natural, non-GMO, cholesterol free and kosher. 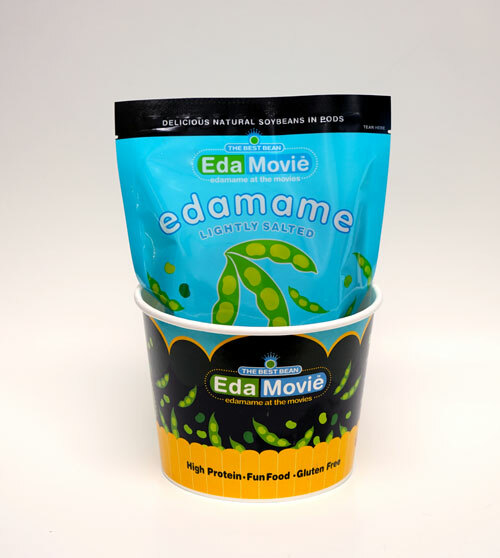 Each bag of EdaMovie™ is an 8 oz serving of ready-to-eat edamame, lightly salted in a microwavable bag and comes with a bucket container for pod disposal. Already this package design has received a national award. EdaMovie™ has also teamed up with Variety so that each bag sold will help a child in need. Come visit EdaMovie™ at Cinemacon 2015 and www.edamovie.com.